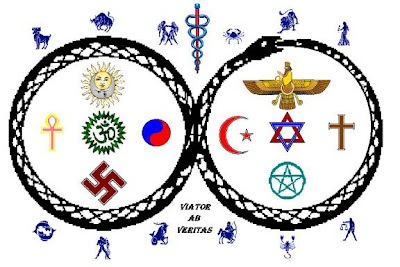 The picture above shows the many symbols of mans quest for the truth. It's Latin phrase means "Wayfarer's of the Truth"...proving how difficult the "truth" can be to find. I believe the seeds of truth can be found in every symbol you see above. But again, how can you determine the truth when it is so easy to manufacture in today's society? The old saying of "the truth can set you free" is not always true. When people distort the truth for their own agenda "the truth can enslave you". The Spirit of Discernment is so necessary to embrace, encourage and nurture in life. It's the Soul's compass when sailing the seas of truth. Truth is many-sided, so embrace the KMSA philosophy of Unity through Diversity and love and have patience for those who do not see the truth as you do. I supposed it showed that we all take people on face value and what they give us, with no-one being impertinant to question whether it was the truth, and maybe we invegale any truths out of people by other means than a straight question. Finally one mad fool broke cover from the bushes....a guy who had been a long time friend and was crazy about her.... and asked her if she would ever go to bed with him. You could have heard a pin drop when she said "No, it would ruin a great friendship"......and you could almost hear the air coming out of the balloon of hope and delusion 'that maybe one day'..that he'd carried around with him for so long. So Knights..AND Ladies. would you wear a Red Light???? or more interestingly would you have twenty-four hours where you told the truth to anyone who asked you a question...? "Ain't that the truth?," she asked. "It is to me," he said. No red light on my head please. I reserve the red light for when it comes on in the confessional that signals its my time to maybe tell the truth!